Heads of State, Prime Ministers, Lord Mayors, Mayors, School Children, Girl Guides, Boy Scouts, Sea, Army and Air Cadets, Charities, Community Groups, Commonwealth Ex-Servicemen, a major Shipping Line, Town Councils, Local Authorities and others around the world will raise more than 730 Commonwealth flags together at 10.00hrs on Monday 9 March 2015 in one common celebration of this amazing family of Nations that encompass the Globe. This unique initiative, in its second year, has once again caught the imagination of thousands of participants from all walks of life, joining with others across the Commonwealth in associating themselves with widespread public expression of commitment to the Commonwealth, appreciation of the values it stands for, and opportunities offered to its citizens around the world. For the ‘first time’ in maritime history, the Commonwealth flag will be raised onboard the 11 ships by the worlds leading Cruise Line/s – P&O & Cunard Line, as they travel the world that morning. All the 22 Town Councils in Norfolk are taking part too, by raising their flags at various locations throughout the County through the generous, financial support from Nwes and Ex-Servicemen’s organisations in the capital cities of 21 Commonwealth countries will be raising the flag too at 10.00hrs that morning, led by The Royal Commonwealth Es-Services League in London, providing the event with involvement from all areas of the international community. Scouts in New Zealand, Malaysia, Samoa, Jamaica, Belize, Mauritius, Sri Lanka, Bahamas, Grenada, Maldives, Trinidad & Tobago and Malta will be raising the Commonwealth flag at 10.00hrs that morning, joining others around the Commonwealth in this exciting initiative. A Personal Message from His Excellency Kamalesh Sharma, Secretary-General of the Commonwealth, and a specially written Commonwealth Affirmation will be read out at each ceremony before the raising of the Commonwealth Flag at 10.00hrs, in a show of unity for this great family of Nations that encompass the globe. Charity teams from Fields of Life, a Northern Ireland and Uganda based charity will mark the day by taking Commonwealth flags to the top of the UK’s four highest National Peaks, using the occasion to raise funds and profile for their worthy cause: Scafell Pike, England- Ben Nevis, Scotland – Mount Snowdon, Wales; and Slieve Donard, Northern Ireland, along with raising the flag in five schools, one in each of the five Regions across Uganda. For the first time, Cadets from the Royal Air Force Air Cadets will be participating in ‘Fly a Flag for the Commonwealth’ on 9th March 2015. Commonwealth flags will be flown by Air Cadets in each of the six Regions of the Air Training Corps, especially as there are close ties between Air Cadets in the UK and Cadets in other Commonwealth countries, and Cadets will be proud to celebrate the values of the Commonwealth on 9th March 2015. 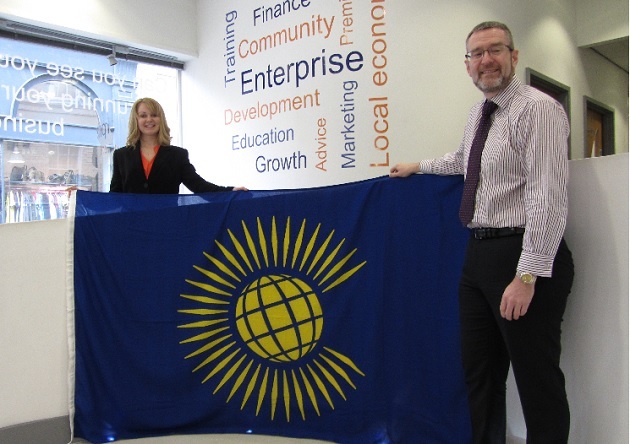 Commonwealth flags will be flown at many locations of special significance including six locations on the George Cross Island of Malta, Tristan Da Cunha, the remotest UK Territory in the world, St. David’s in Pembrokeshire: the westernmost city in Wales; Carlisle in Cumbria: the northernmost city in England; Lowestoft in Suffolk: the easternmost town in England; and Unst in the Shetland Islands, the most northerly inhabited island in Scotland, the Rothera Research Station on the Antarctic Peninsula, and at the Halley VI Research Station on the Brunt Ice Shelf, as well as King Edward Point and Bird Island in South Georgia, to name but a few. His Excellency Kamalesh Sharma, Secretary-General of the Commonwealth said, “Fly a Flag for the Commonwealth is a most imaginative way for people in local communities – wherever they live, learn or work – to join together with others throughout the Commonwealth in a spirit of respect and understanding to celebrate the variety and unmatched diversity of our global family. I welcome and commend it. Representatives from Nwes are honoured to be taking part in the ceremony in the parish of Thorpe St Andrew on Monday, when dignitaries from Thorpe St Andrew Town Council will be raising their flag for the Commonwealth.